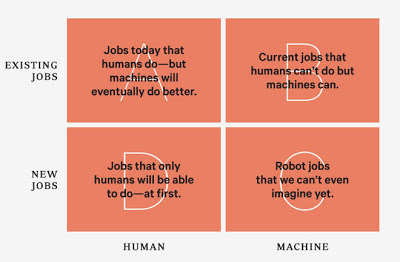 "...before the end of this century, 70 percent of today’s occupations will likewise be replaced by automation. Yes, dear reader, even you will have your job taken away by machines. In other words, robot replacement is just a matter of time. This upheaval is being led by a second wave of automation, one that is centered on artificial cognition, cheap sensors, machine learning, and distributed smarts. This deep automation will touch all jobs, from manual labor to knowledge work. First, machines will consolidate their gains in already-automated industries. After robots finish replacing assembly line workers, they will replace the workers in warehouses. [...] Next, the more dexterous chores of cleaning in offices and schools will be taken over by late-night robots [...] The highway legs of long-haul trucking routes will be driven by robots embedded in truck cabs. All the while, robots will continue their migration into white-collar work. [...] Any job dealing with reams of paperwork will be taken over by bots, including much of medicine. Even those areas of medicine not defined by paperwork, such as surgery, are becoming increasingly robotic. The rote tasks of any information-intensive job can be automated. It doesn’t matter if you are a doctor, lawyer, architect, reporter, or even programmer: The robot takeover will be epic." I, for one, welcome the ascension of our overlordbots.